In Saigon, on the Day of The God of Wealth, offerings to Him are not complete without this fish. 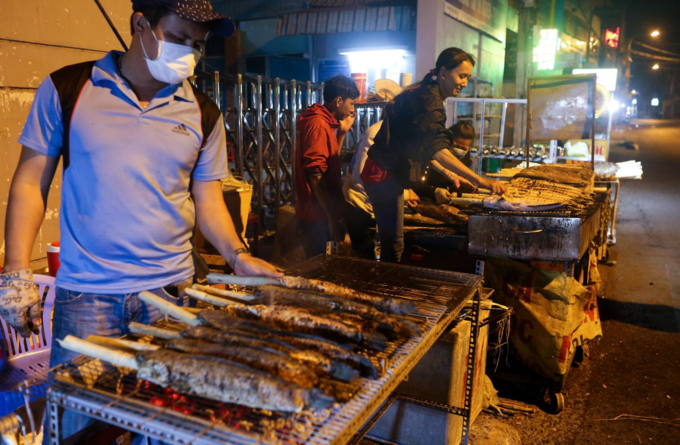 On Tan Ky - Tan Quy Street in Saigon, many stalls have been selling grilled fish for more than a decade. 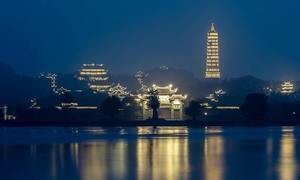 But they are busiest on the Day of the God of Wealth, which this year falls on February 14 (10th day of the lunar year). From the previous evening workers at the stalls were busy making fire and preparing and grilling the fish for the morning. 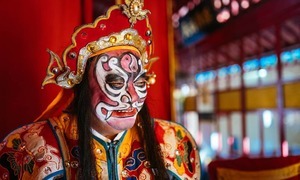 The God of Wealth, worshipped by many families, is believed to control money and finance. People, especially families doing business, pray to Him for wealth and luck for the whole year. 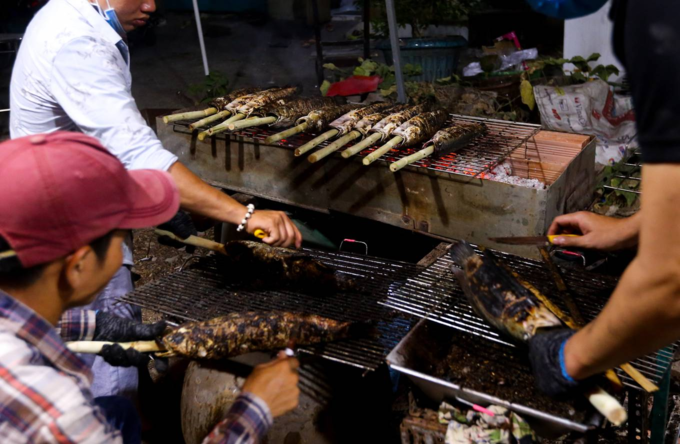 In the south, when people pray to Him, they usually make offerings of gold, fruit, grilled meat and, unfailingly, grilled snakehead fish. 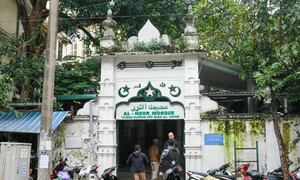 The grilled fish stalls had to employ more staff to work throughout the night. Each person was in charge of a particular task like keeping the charcoal fire going, skewering the fish on sticks and washing vegetables. 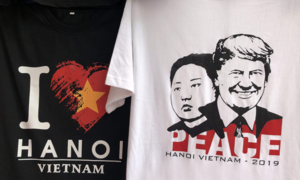 "On normal days we have only five people to help, but when the Day of the God of Wealth comes we need 10 times more people working from the previous night to morning to be able to supply the fish in time," Nguyen Thi Cuc, a stall owner, said. 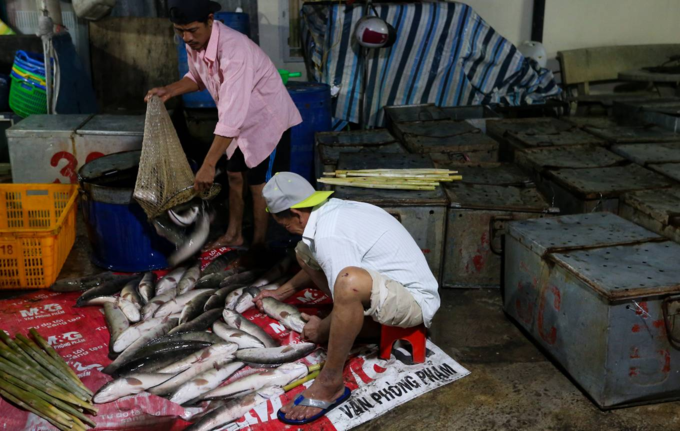 Dozens of boxes containing fish were delivered to Cuc's stall from An Giang province in the Mekong Delta through the night. 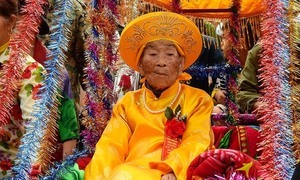 She said: "This year I bought nearly 3,000 fish, equal to three tons. We only sell 200 fish on a normal day." 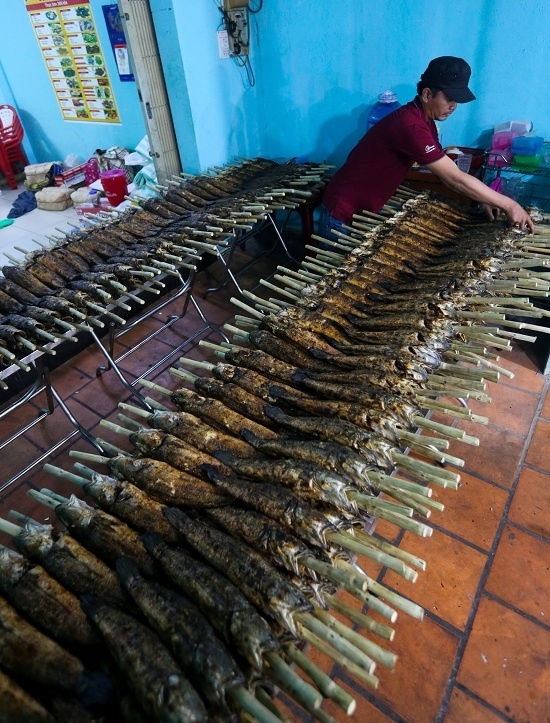 Sugar cane delivered from the southern province of Tay Ninh is sharpened and stuck through the fish's body. 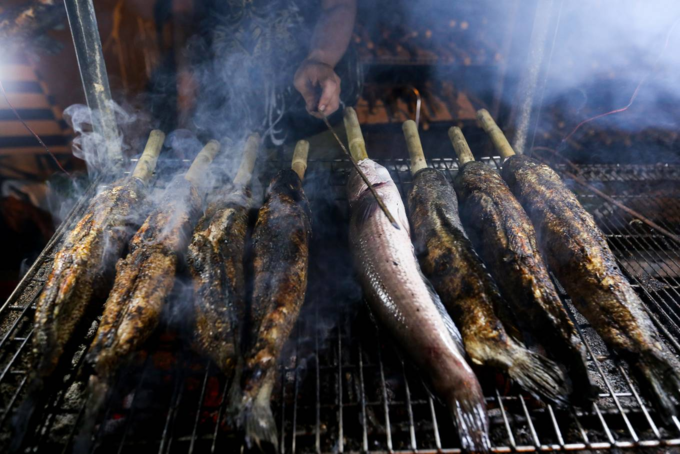 According to some cooks, grilling the fish with sugar cane makes the fish’s flesh sweeter. 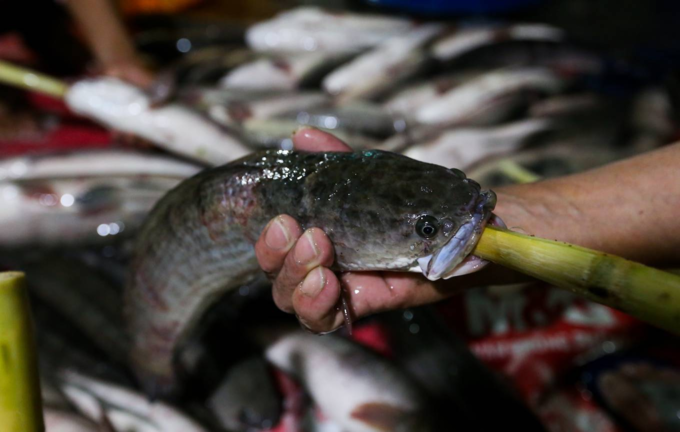 The snakehead fish does not need to be seasoned and can be grilled whole. The cook also does not have to get rid of the fish’s scales and offal. It takes about half an hour to grill a fish. 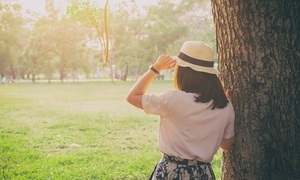 "The cooks have to be careful and keep turning the fish so that it is cooked evenly and is not burned. On normal days we take out the fish gallbladder, but on the Day of the God of Wealth the fish should be intact when offered and so it must not be taken out," Hoa, a fish griller on the street, said. 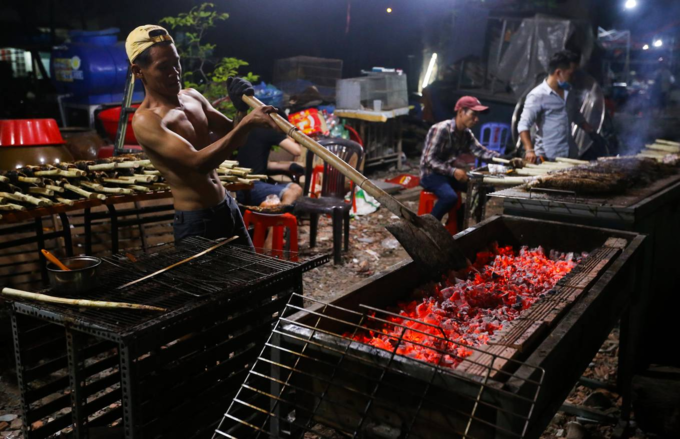 Once the grilling is done, the cooks use a knife to scrape off the coal dust and soot on the fish. However, they need to be careful since a fish offered to the God of Wealth must be intact. 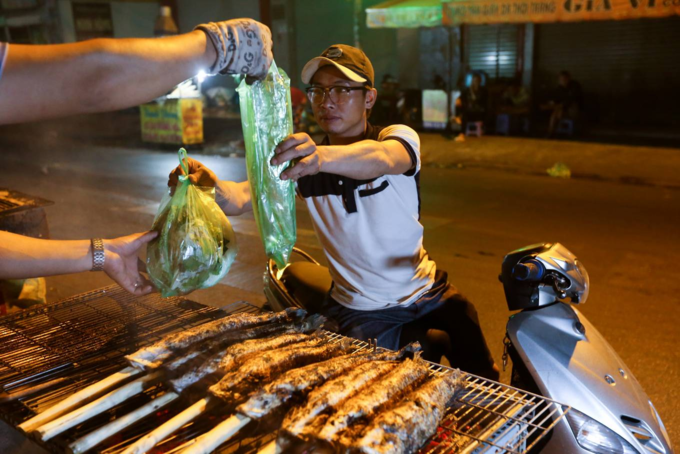 Along the two-kilometer-long Tan Ky - Tan Quy Street, people hurry to prepare the grilled fish. The fish can be kept for a day. "Only on this day in the year can we sell a lot of fish," Thi, another stall owner, said. 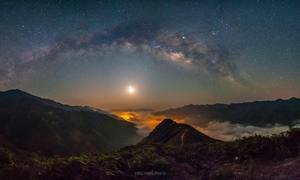 "So the whole family stays awake at night to grill." 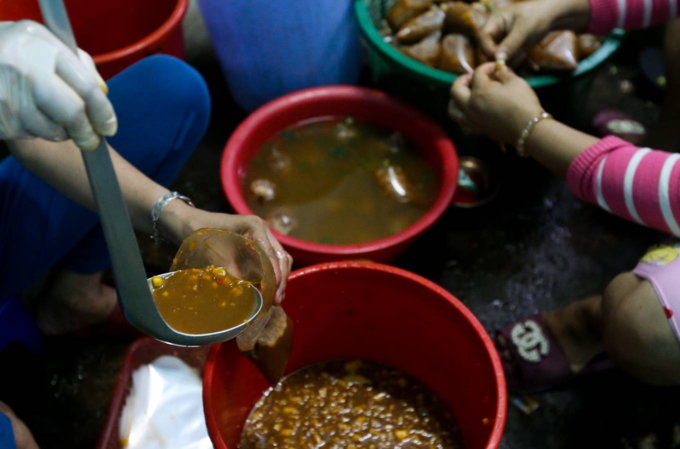 In a corner of the kitchen, a group of women constantly poured fish sauce into a bag. Each store has a secret recipe for mixing the fish sauce. 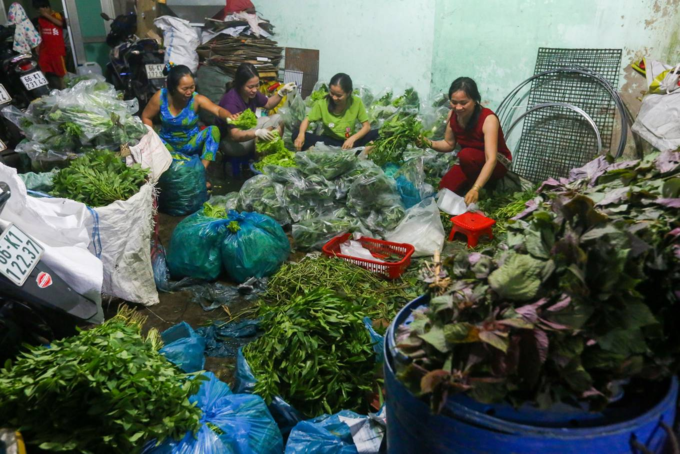 All kinds of fresh vegetables eaten with the grilled fish like cinnamon, perilla and basil are also prepared in the night and packed in hundreds of plastic bags. Each stall buys from a few hundred kilograms to more than a ton of vegetables. At night many customers came to buy the grilled fish. 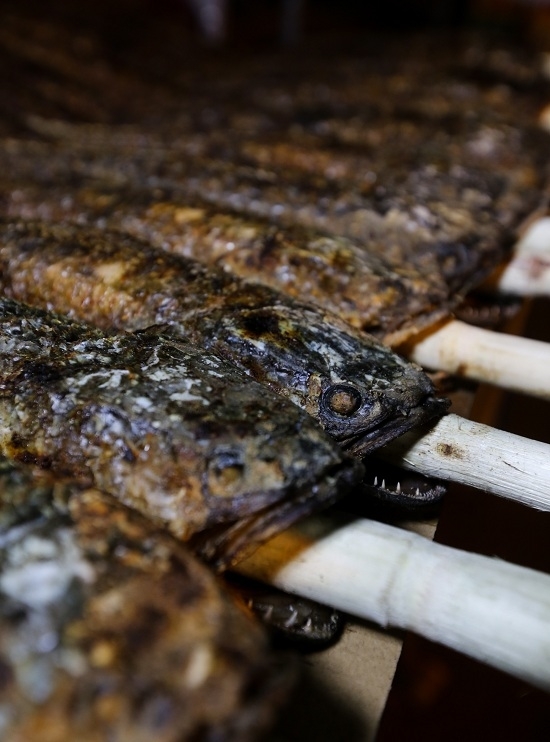 A grilled snakehead fish served with vegetables and peanuts costs VND130,000-170,000 ($5.58-7.29).